You've imported transactions. Life is good. 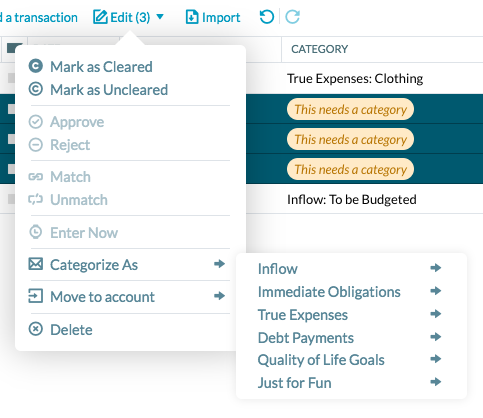 Now it's time to make sure your budget knows exactly what those transactions mean in your budget. A budget that doesn't know about spending? Not a budget. That's why you'll see warnings about it in three different places if you don't categorize a transaction. If your imported Payee is one you use often, the most recently used category will be automatically assigned. Something different this time? Just change it. Love the auto-categorization? Time to approve those transactions. And if you've got multiple transactions that need the same category? Aren't you lucky? Are the Payee, Category and Amount just how they should be on your transaction? Go ahead and approve it. Do you not want to import the transaction at all? Reject it. When you enter a transaction in the web app or on your mobile device, then later import the same one, the two versions will be matched automatically. You can see the details of the imported transaction by clicking on the match link. Approve the match or unmatch the transactions (useful if you had multiple transactions on the same day with the same amount that were mistakenly (but you'd have to admit logically) matched. Occasionally, an imported and hand-entered transaction will not automatically match – typically because the dates of the two transactions are further than 10 days apart. Don't worry, you can manually match them up in 5 clicks. 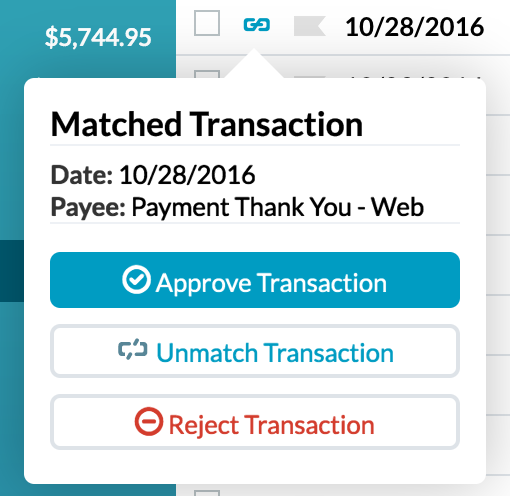 Select the two transactions that should be matched. Click Match in the Edit menu. As with automatic matching, your last step is to approve the match. In some cases, YNAB cleans up payees to remove the extra stuff banks tend to add, like DEBIT*246736. You can still reference all the payee details—even after you've matched the transaction. In the payee field of a transaction, click Show Bank Import Details. There you'll see the full payee exactly as we received it from the bank.